Port Metro Vancouver is Canada’s largest and busiest port, a dynamic gateway for domestic and international trade and tourism, and a major economic force that strengthens the Canadian economy. Its mission is to lead the efficient and reliable movement of cargo and passengers in a manner that supports Canadian growth and prosperity, now and in the future. 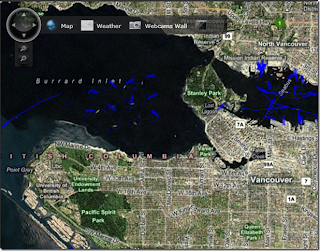 No surprise to me that they selected Microsoft Virtual Earth as their mapping platform for the interactive map on their Port Metro Vancouver web site to allow users to locate and track vessels and more. This application is really slick. It takes advantage of Microsoft Silverlight to provide an interface that is fast, smooth, easy to operate, and just really cool. The site uses a map control that is customized and different from what you may be used to seeing in other Virtual Earth applications. All functional options are included here and displayed when you mouse over the menu items. The menu option to the far right (noted in red in the screenshot below) provides a full screen view of the application and really blew me away! ALL Virtual Earth applications should offer this!